Use the Return Refund to Debtor1 command (not available in MoneyWorks Cashbook) when a debtor has overpaid you or when you have issued a credit note to a debtor and wish to clear their credit balance by paying them. Note that the Owing column displays the total customer balance, not the amount of individual credits. 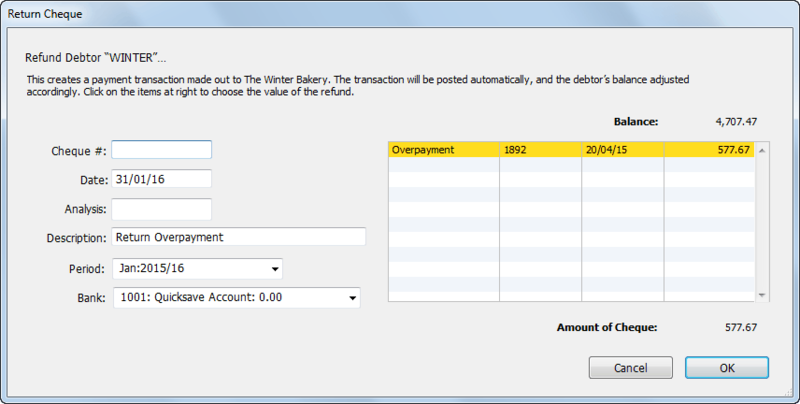 The Return Refund dialog box is displayed. Any outstanding credit notes plus any unallocated overpayments that have been received from the debtor will be displayed and highlighted in the list on the right-hand side of the dialog box. The items that you click on will be unhighlighted and the refund amount will reduce accordingly—click on an item again to rehighlight it. If the amount you want to refund is not represented exactly by one or more of these entries, you will have to enter a special credit note/debit note pair and use the new credit note here. You can also change the date, cheque #, analysis and description. A Payment transaction made out to the debtor will be created and posted. It will credit the nominated bank account and debit the Accounts Receivable control account for the debtor. If paying the refund by cheque, it will need to be hand-written. Note: Overpayments, by definition, do not include GST/VAT, and hence any payments you return will not include any GST/VAT. Payment returned for a credit note will include any GST/VAT specified in the credit note.